We rang in 2013 with an Epiphany. More precisely, we celebrated the 12th day of Christmas with a gathering of friends, a mound of good (mostly vegan) dishes, and an embarrassing amount of alcohol. We celebrated decadence. The epiphany? That a decadent feast need not be wasteful. We simply needed to plan with an eye to repurposing the leftovers. This we did–but only after we had identified the signature dish for the meal. Our dinner parties usually begin with a single idea. It can be a new dish, a technique, a flavour, or a beverage. (Yes, we once planned a five-course meal entirely inspired by our homemade Dark-n-Stormies.) Our desire to feed others is almost always triggered by one event. The trigger for our epiphany party? Veggie-based dips and spreads shared by some of the amazing chefs we’ve met through this blog, Two Spoons and Food to Glow. On 19 December, Two Spoons posted a lovely instructional guideline for using vegetables to make flavourful spreads and dips. And the ideas are clever. I made two dips using ideas from her post that relied on winter veg, nuts, olive oil, and mushrooms. 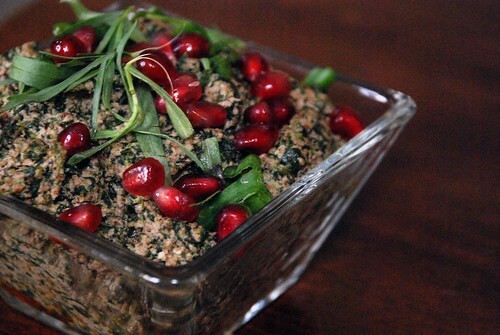 And then there was the Spinach Pkhali with pomegranate and fragrant fresh herbs that Food to Glow posted on 13 November. We’d found a prettier, and tastier, version of the nut crusted cheese loaf. One week later, these dips (and the rest of the food on the menu) were fully enjoyed. None of that meal went into the bin. How? It helps that one of our guests was vegan and snapped up most of our vegan remains in his doggie bag, including the two non-cheesed dips and the two remaining okara falafel. The pistachio dip was used as a pesto over pasta. I put the mushroom dip on toast (like a terrine), used it as filler for wonton ravioli, and included it in an egg omelette. I suspect there is are many other ways to incorporate the dips into soups, salads, biscuits and muffins. But I ran out of dip before I could test the theory. For those who are interested, here is our menu from that party. We’ve shared the recipes for the falafel and ginger beer in previous posts. The others, I will share in the coming weeks. This entry was posted in Waste less recipes and tagged dinner party, Epiphany, green living, leftovers, meal planning, vegan, vegetable dips, vegetarian by Bonnie Lee. Bookmark the permalink. Thanks for stopping by. It was nice visiting your blog.